Undoubtedly, if the audience feels that the effect they're watching could have been achieved through sleight of hand they will not have a magical experience (although they may be quite impressed with your skill). Nevertheless, it's a pretty weak strategy to hope the audience will think, "He couldn't have used sleight of hand because he doesn't seem capable of it." Fortunately, there is another possible strategy. 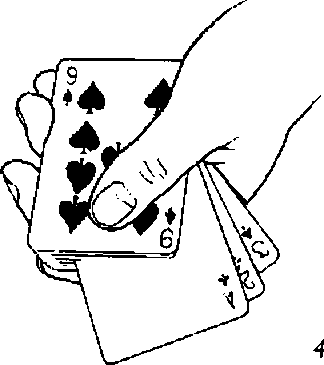 If an effect is properly constructed, the audience should think, „ "He couldn't have used sleight of hand because sleight of hand ain't account for what J just saw" For example, the spectator may, in effect, think, "He couldn't have used sleight of hand because the card changed while Alice was holding it." Or he may think, "He couldn't have used sleight of hand to turn the ace of spades over because the aces were in the card case when it turned over." Or he may think, "He couldn't have used sleight of hand because the two packets never came anywhere near each other." In other words, the spectator should conclude that you couldn't have used sleight of hand, not because you're too incompetent to do so, but because the very design of the effect eliminates sleight of hand as a possible cause for the perceived elEect. Consider the classic coin effect Spellbound. The very nature of the effect screams "sleight of hand." One coin changes into another; this suggests a switch. The transformation occurs in the performer's hands; this suggests a sleight-of-homd switch. The transformation occurs behind the performer's lingers; this must suggest to any intelligent person that the switch is caused by the performer s fingers. The fact that the transformation happens so rapidly only suggests that the performer must have very fast fingers. As long as the audience is completely convinced that your hands are otherwise empty, it wouldn't matter if you preceded the effect with a dozen coin flourishes. They would still respond to the effect with the feeling, "That's impossible." ii they're not convinced your hands are empty, it won't matter how hard you work to conceal your skill. For Spellbound to be magical, the sleight-of-hand hypothesis must be eliminated by design, not by concealing the fact that you possess skill. If an effect is well constructed, you can even tell the audience in your patter that it's done by sleight of hand yet still have it register as an impossibility. a good example is Larry Jennings' Open Travelers. Despite the fact that the presentation revolves entirely around palming (a sleight-of-hand based explanation if ever there was one), the audience's response is, "That's impossible!" Another example is René Lavand's performance of Oil and Water. His presentation is entirely built around the refrain that perhaps he can repeat the effect still more slowly trby changing techniques," (in other words, by using different sleights). The fact that he continually reminds the audience that he is achieving the effect through sleight of hand doesn't diminish the magical impact at all. In the final analysis, what matters in Jennings' Open Travelers and Lavand's I Can't do it Any Slower is that both are structured so as Co preclude sleight oi hand as an explanation. Therefore, even when the performer offers sleight of hand as an explanation, the audience experiences the effect as magic. The moral is simple. If you want people to think that it couldn't have been done by sleight of hand, perform effects that look like they couldn't have been done by sleight of hand. Some good examples from this book are Peek Performance, Ace in the Pocket, The Color of Money, Pass the Garbage, and UIti7nate Fusion, Sleight of hand cannot give you control over a deck that's in someone else's pocket. It cannot allow you to switch a card in a spectator's pocket with one held between his palms. It cannot cause packets of cards to transpose when they never go anywhere near each other. It cannot cause cards to turn over under a spectator's hand or cause two cards to melt into one. Laypeople are intelligent enough to realize that. Of all the possible approaches to convincing an audience that an effect is not achieved by sleight of hand, the weakest is to try to make them believe that you're not capable of sleight of hand. The strongest is to perform effects that can't be explained by sleight of hand. If sleight of hand can't explain the effect, knowing that you have sleight-of-hand ability won't weaken the effect.